The middle market – companies with $10 million to $1 billion in revenue – have been one of the fastest-growing business segments in the U.S. economy, outperformed larger entities through the financial crisis of 2007-2010 and expanding both their workforce and geographies in which they do business. It should come as little surprise that travel volume of the middle market also is growing. So too are the challenges of dealing with such expansion, according to a recent survey conducted by The BTN Group and American Express Global Business Travel. We asked travel managers at companies with annual revenues of $10 million or more and U.S.-booked air spend of up to $12 million to share insights about their programs. Challenges include documenting program value and finding the time, management support and technology tools to most effectively manage the spend category, respondents said. 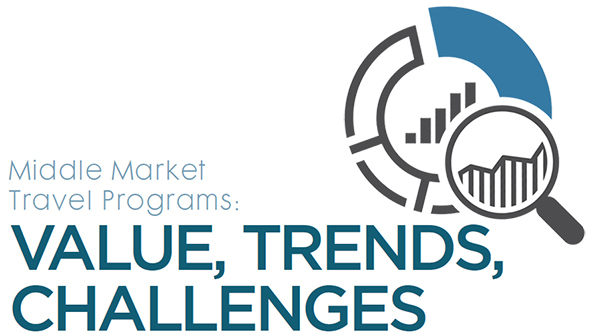 Download the full report now to learn more about the challenges and ways respondents identified to strengthen their travel programs. American Express Global Business Travel (GBT) is a joint venture that is not wholly owned by American Express Company or any of its subsidiaries (American Express). “American Express Global Business Travel,” “American Express,” and the American Express logo are trademarks of American Express and are used under limited license. Copyright © 2016 Northstar Travel Media LLC. All Rights Reserved.